Since the very old times, Aphrodite, the goddess of love, worshiped in Paphos. The connection between Paphos and Aphrodite starts from Petra tou Romiou, about 3 km from Kouklia, where according to the tradition she was born. Kouklia or Palepafos (i.e. the Old Paphos) was the ancient capital of Paphos. One of the biggest sunctuaries dedicated to Aphrodite was built here and for the annual celebration attracted visitors from all over Greece and the countries around Cyprus used to come to take part. The archaeological site of the temple of Aphrodite is just outside the modern village of Kouklia. 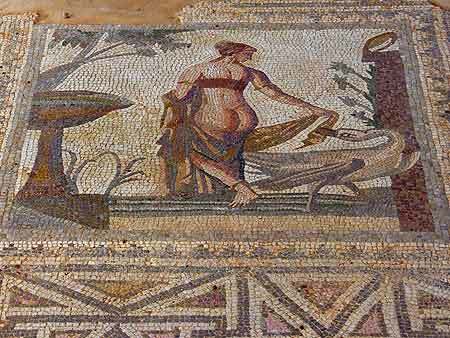 One of the most famous excibitions, is the mosaic of Leda and the Swan.